In early 2013, my grandmother, Jane Heidorn, moved into a nursing home after a stroke left her unable to care for herself. After over a decade of living alone, she was forced to consider a future without the autonomy she had enjoyed, and - at least initially - it hit her hard. The move brought her closer to me, and we'd spend Sundays listening to her old 78s on a small record player in her room, eating lunch in the cafeteria, reminiscing. I'd take her outside in her wheelchair and glide it along the twisting walkways that cut through the lawns and shuffleboard courts outside the complex, trying to keep her spirits up, reminding her of bridge games and activities, of the next time I'd visit. After a few months, I asked if she'd be interested in recording a version of an old Stephen Foster song, "Hard Times Come Again No More". She'd always sung in church, and I knew it was important to her. I figured, if nothing else, it was something to look forward to, something to work on. She didn't know the song, so I brought her the lyrics and a recording of an arrangement I'd put together. She said she'd listen and try to practice. After a week or two, she agreed to give it a shot. Over the course of a few weekends, I'd bring my desktop computer out to the nursing home and record her in her room. We'd take it bit by bit. She'd sing a verse, maybe a whole chorus, but it was hard for her. She'd quickly get exhausted, and I did my best to let her know not to worry, that we'd keep working on it, that we'd try it another day. Once we had finished, I told her I would do my best to honor her voice. 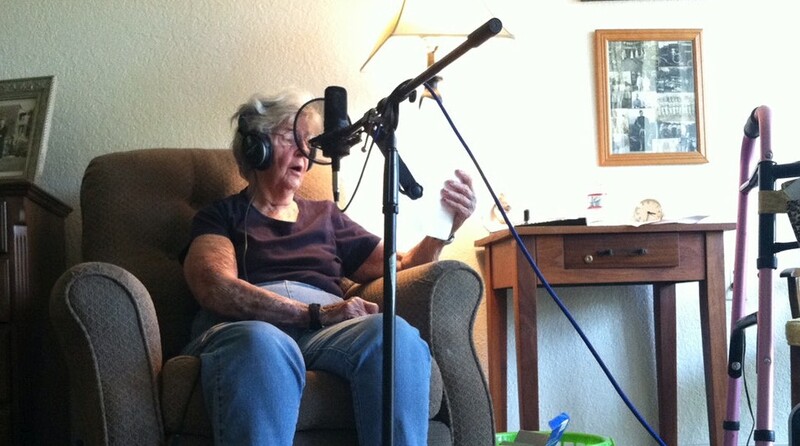 A few months after we had completed the recording, she was diagnosed with a stomach aneurysm and put into hospice care. It was sudden; it seemed to come out of nowhere. The doctors gave her a few days, maybe a couple of weeks. My dad flew into town that evening, and we drove to the nursing home to spend time with her. Later that night, after hanging out for a while, talking and trying to keep her mind off things, my dad left the room to take a phone call. I pulled a chair up next to her bed as the door closed, and I said, "I'm still here, grandma. We're not going anywhere." We sat quietly for a while. She dozed off. I could hear the gentle wash of the freeway in the distance; a dog barked from the neighborhood. When she awoke, she took a gentle breath, then said, "Will you sing to me?" I'm not much of a singer. I felt embarrassed. But what could I do? I wasn't going to refuse. "What should I sing?" I asked. "Sing the song we played together." She said, softly, her eyes still closed. And so, as the palm trees swayed gently in the orange glow of the streetlights outside her window, I sang this song to my dying grandmother. I knew the words because I'd heard her sing them so many times. When I finished, she said "Oh, thank you." She passed away a few days later.